Last week’s Chalky, Part 2 was an overview of the major Human Powered Vehicle (HPV) design issues – the importance of seating, suspension, frame stiffness and so on. This week, I am going to cover the development of the unique front suspension. 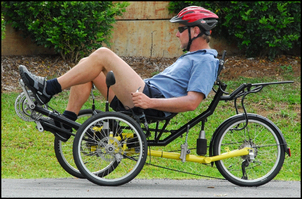 The machine – christened Chalky – is a rear wheel drive, tadpole trike (ie two front wheels, one rear) that uses a recumbent seating position and so has the pedals out the front. The design goals include a mass of under 21kg, 3-wheel brakes, 81 gears, able to be broken down for shipping, ability to stably carry a large load (for touring), and to have ride and handling as good as my previous Air 150 Recumbent Trike design. As with the Air 150, the frame and suspension will be made from thin-wall, chrome-moly steel tube, nickel-bronze brazed together. Firestone rolling lip airbag springs will again be used. 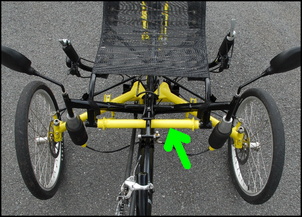 Designing a light, durable and long-travel suspension system for the front of a tadpole HPV trike is extremely difficult. Traditional (read: automotive) design approaches like double wishbones are too heavy (four arms and normally a massive 12 pivot points), and approaches like MacPherson struts are also problematic – this time primarily because no lightweight off-the-shelf combination spring/dampers are available that are designed to cope with the bending forces involved. On my previous Air 150 I used a unique front suspension design – semi-leading arms with high pivot points. The semi-leading arms can be thought of as being like automotive semi-trailing arms (eg on the back of an old BMW or Datsun) but facing forwards. 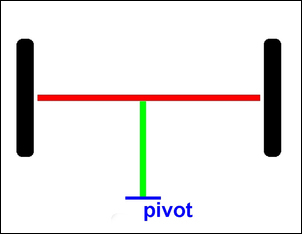 The high-mounted pivot points resulted in a high roll centre and a relatively short virtual swing arm length. A very stiff anti-roll bar was used, and suspension travel was 6 inches. During suspension movement, the Air 150’s track altered (so providing damping without the need for external dampers), the camber changed, and - to a smaller extent – the castor also varied. Despite going against every prevailing suspension textbook wisdom, the suspension worked extremely well. 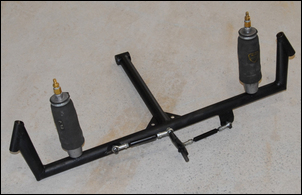 However, the development of this suspension design over two machines (an initial prototype Air 130 and then the final Air 150) showed that the anti-roll bar (arrowed) needed to be so stiff that the suspension was, to a large degree, no longer an independent design. So on the Air 150, the front suspension design comprised two semi-leading suspension arms, each with an inboard pivot and an outboard kingpin; an anti-roll bar supported on two pivots; and two anti-roll bar links using a total of four rod-ends (rose joints). Over the Air 150, the major design goal for the front suspension of Chalky was for a lighter design that integrated the anti-roll properties into the suspension structure – ie, did not need an ‘add-on’ anti-roll bar. Suspension travel again needed to be around 6 inches. When looked down on from above, Chalky’s front suspension is shaped like the letter ‘T’. 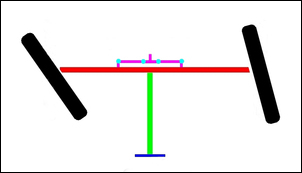 The top of the ‘T’ is a solid axle (the red line) that joins the two front wheels, while the upright of the ‘T’ (green line) points towards the back of the machine. Solid (beam) axles are widely regarded as being very low tech – suitable only for agricultural machines like trucks. However, the use of a beam axle in this application actually results in a very light-weight design. The upright of the ‘T’ is a torsion tube. It is pivoted at its base such that the wheel axle can rise and fall, but twist (eg when the body rolls) is resisted. 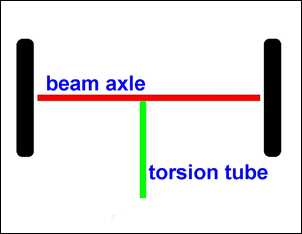 That is, the torsion tube’s pivot point is a horizontal axle (blue line), with its axis at right-angles to the length of the car. To prevent the wheel axle moving laterally (ie by bending the torsion tube), a Watts Link is placed at the mid-point of the beam axle. 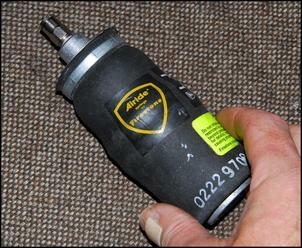 This prevents the axle from moving sideways, while still allowing free vertical movement. Firestone model 4001 rolling-lip airbag springs are located a little inboard of the 16 inch wheels. These air springs are light in weight, have no stiction, can be easily optimised via internal pressure for differing load carrying conditions, and can be mounted without the ends needing to stay parallel through the full suspension movement. This apparently simple suspension design is actually quite complex in the way it works. Let’s take a look. Over two-wheel bumps (eg a speed hump), the front wheels rise and fall together. That is, the wheel travel and the spring travel are the same (ie a 1:1 motion ratio). The spec’d travel of the air springs is 3.6 inches (but in this front application I run them at about 3.8 inches), so over a two-wheel bump, the maximum front suspension travel is 3.8 inches. Over this type of bump, the torsion tube acts just as a suspension member – it doesn’t twist. 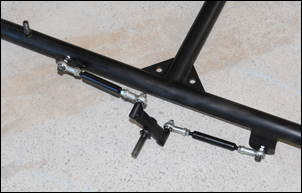 The Watts Link ensures the axle rises and falls without any sideways movement. Steering castor varies with wheel movement, with the castor increasing as the suspension compresses. Over a one-wheel bump (the vast majority of bumps – let’s imagine a stone on the road) a single wheel rises. Because the axle is supported at the opposite end by the other wheel, and because the spring is mounted inboard from the rising wheel, and (finally) because the torsion tube can twist (the inertial mass of the rider resists being rotated, so the torsion tube twists instead), the compression of the spring on a one-wheel bump is less than it would be for a two-wheel bump of the same size. Therefore, compared with a two-wheel bump, the spring rate is effectively lower, and the maximum travel is potentially higher – probably at least 6 inches. In addition to the air spring, the torsion tube also resists the one-wheel bump (remember, it acts as an anti-roll bar, and anti-roll bars resist one-wheel bumps). One-wheel bumps attempt to cause some sideways movement of the axle, but this is prevented by the Watts Link. When cornering, the body rolls. Resisting this is the air spring on the outer wheel and also the longitudinal torsion tube. 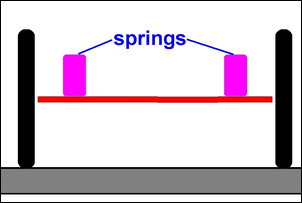 The spring has a slightly rising rate (it gets stiffer as it is compressed more) but the torsion tube is linear in its torsional behaviour. It’s in cornering that the Watts Link is subject to its greatest forces, with its action stopping the axle being pushed sideways. The suspension sees dive much like a two-wheel bump – the spring rate is effectively higher than it is for one-wheel bumps. Another characteristic of this suspension system is not in its behaviour but in its shape – there is a lot of room for steering lock to occur. As implied above, the spring motion ratios are kept low. Compared with motion ratios where the spring moves far less than the wheel, this approach reduces bending stresses in the suspension arms. In the case of the air springs, it also allows a lower inflation pressure to be used (giving better headroom to the max allowable pressure, and so also permitting the machine to cope with bigger load variations). This suspension design uses about 25 per cent less tube than the Air 150’s semi-leading arm design. The front suspension arm, complete with Watts Link and rear bearings, weighs 1.7kg. With the two air springs, this rises by 700 grams for a total of 2.4kg. The leading, torsion tube, beam axle with Watts Link design also has some shortcomings. Firstly, this suspension design doesn’t have a dynamic negative camber increase on bump – that is, the outer loaded wheel does not adopt negative camber during cornering. But, in fact, it actually does! Secondly, this suspension design doesn’t have the ‘track change’ damping of the Air 150’s semi-leading arms. After a lot of experience of the track change design I still cannot make up my mind as to whether track change damping is a good idea or not. On the Air 150 it worked very well in terms of damping, but when the machine was ridden really hard, front tyre wear could also be dramatically high. (But then again, when ridden normally, tyre wear was fine!). Having the steering wheels on the one axle also has the potential to give bad steering shimmy, a problem that often occurred in cars of the 1920s and 1930s equipped with solid front axles. (It also can occur in unusual bicycle designs.) However, shimmying always seems to be able to be overcome, either by revising stiffness of bushes (etc), or by changing the steering stiffness and/or geometry. I also wonder if shimmy of those old cars wasn’t exacerbated by the zero scrub radius, low castor angles and positive camber then often adopted. The roll centre of the suspension is low. 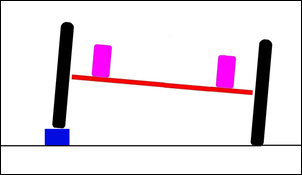 This was required for packaging purposes, but it also means that the amount of body roll that occurs for a given cornering force is higher than it would be if the roll centre was further above the ground. Finally, the pitch centre is also low – which could cause dive problems when braking (but at least dive is resisted by both springs) and allow rear suspension extension, again when braking. Another advantage of such a simple design of suspension is that it is easy to make. The torsion tube was also made from 32 x 0.9mm chrome moly tube. 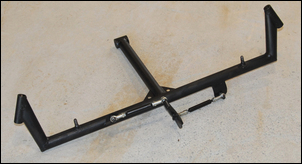 (This size material was also used as the anti-roll bar on the Air 150.) The torsion tube is 335mm long. The torsion tube suspension pivot point comprises two 30 x 10mm sealed bearings with a long 10mm through-bolt. The Watts Link design and build was initially a problem – until I found a simple guide to all the required dimensions. 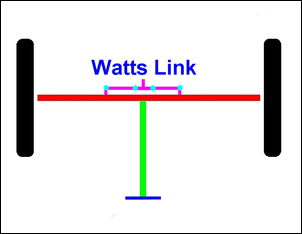 (See the ‘Watts Link Design’ breakout). This design info allowed the Watts Link assembly to be kept quite small while still allowing a vertical axle movement of 6 inches with only a few millimetres sideways motion over that full distance. The Watts links were made from 12.7 x 0.9mm chrome moly tube. Six millimetre rod-ends were used. As with the other suspension pivot, two 30 x 10mm sealed bearings with a 10mm through-bolt were used for the Watts Link frame pivot. I have a rare series of books published in Moscow in 1975. Called ‘Mechanisms in Modern Engineering Design’, the five-volume series was authored by Prof Ivan Artobolevsky and contains literally thousands of descriptions of different mechanisms. 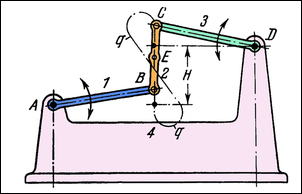 In the section ‘Guiding Mechanisms and Inversors’, the ‘Watt Four-Bar Approximate Straight-Line Mechanism’ is covered – what you and I call a Watts Link. The fascinating thing about the description is that it gives the relationship between the different lengths of arms that is required to achieve the correct outcome. The diagram from the book is reproduced here. Lengths AB must equal CD; length BC must be 0.62 times the length of AB (or CD); AD must equal 2.15 the length of AB (or CD). By using the proportional relationships shown in the diagram, and making a simple model, devising an effective Watts Link was done quickly and easily. After having a recent series of disasters in making HPVs (ie building machines that were flops), I resolved to test each element of Chalky before developing the next. Thus I rigged-up a steering system, frame and make-do (solid) rear suspension and before proceeding any further, tested, as best I could, the performance of the front suspension. Initial tests were encouraging, but showed that the Watts Link took quite high sideways forces in cornering and (to a lesser degree) in one-wheel bumps, and so the Watts Link frame pick-up point needed to be strengthened. Furthermore, my greatest worry – the castor change of the steering during suspension deflection – seemed of little consequence. By altering the height of the rear suspension, I could change static castor over a range of 15 degrees – and over that range of castor angles, the machine was still happily able to be steered and ridden. At absolutely maximum trialled castor (about 24 degrees! ), the steering would ‘fall over’ (ie no longer self-centre) when too much lock was applied – but I couldn’t see too many situations where I’d need perfect steering ... and be at full bump... and have a lot of steering lock on! At this stage the front suspension has been made as light as possible. Further gussets or other bracing between its parts may prove necessary (eg will the axle bend backwards momentarily over bumps, thus causing toe [steering] changes that lead to directional instability at speed?) but any such changes will be made only after extensive testing of the full machine. This series is being written as the build and development of Chalky occur, so I cannot state that the front suspension has proved to be perfect in all respects – or, alternatively, that the initial testing wasn’t actually indicative of the final outcome. Right now, I just don’t know. However, at this stage, the front suspension design appears to work very well. It’s also light-weight, can cope with high load variations, and is easy to build. Reading back through this article I am conscious that an awful lot of technical terms are used – roll centre, castor, camber, virtual swing arm length, dynamic behaviour, motion ratios, natural frequencies – and so on. To anyone struggling to understand, it might seem like I am using mumbo jumbo for the sake of being impressive. But one of the huge challenges of successful HPV suspension design is that all of these ideas need to be integrated into a single, lightweight design. It really is suspension design at its purest – to realise good outcomes, you can do literally anything you want.